Full-body plate armor was typically custom-made for individuals, which made armors like the Tri-Disc Armor and Belt all the more common. This armor features a simple breastplate secured with bands around the torso, as well as a matching belt. The reason that armors of this style and type were common is based entirely around the factors of time and cost. Custom-made, full-body plate armor took a great deal of time and money to construct, making less customized armors like this suit more feasible for regular soldiers. This armors chest plate consists of three circular plates attached to a metal backing. This triangular shaped backing has a flat top and rounded corners, and is fastened to the chest via four straps, two of which wrap around the underarms, while the other two loop over the shoulders. Also included with this effective chest plate is an armored belt that features a simple dragon design. This armor is made from quality metal and features a sleek and impressive looking polished metal finish that really makes this armor stand out. 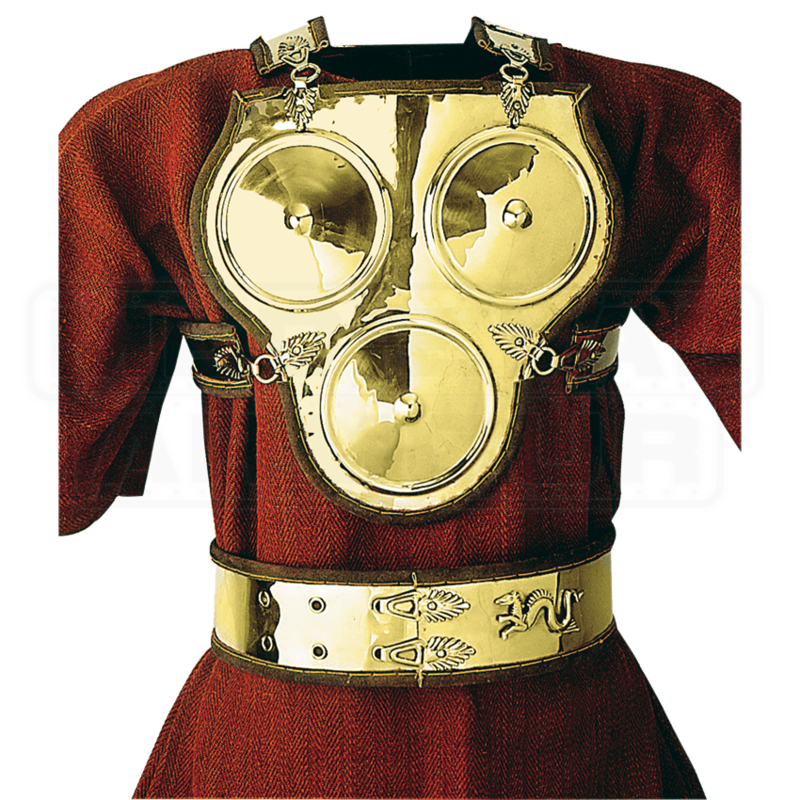 The Tri-Disc Armor and Belt are the perfect pieces of armor to wear whether you are a foot soldier on the field of a re-enacted battle, a general looking for an esoteric and yet eye-catching armor, or a collector who just loves having different styles of armor.